Midlife is a curious time for women, a period of change in more ways than one. This blog was started when I was going through absolute menopause misery and I found that it helped to write about my experience. Along the way I asked a few friends to contribute too. 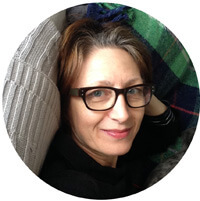 Gradually, as I came through the hell of ‘the change’, the blog became more of a collection of posts about my midlife journey. It’s very personal. I’m interested in our midlife journey as women – what makes us tick, our creativity, wisdom, and energy. How we can face the obstacles that life throws at us with grace and humour. What I’ve discovered is that I love to write. In addition I’ve had to learn how to blog and create this website as well as how to promote it through social media. These are all life-skills that I’ve been able to use in my professional life so it’s win, win. In my day job I’m a graphic designer and art director. I’ve always been interested in creativity – whether it’s craft, gardening, design, cooking or any other artistic venture. 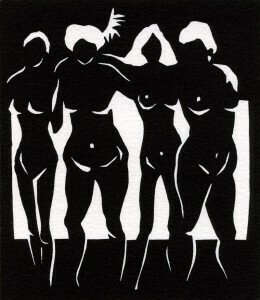 The image of the four beauties shown here is a lino-cut that I made at art college in the 80s to illustrate a poem called ‘Song of Four Women’ by the wonderful Fran Landesman. I think it shows how much I have always valued the friendship of women. If you want to get in touch please feel free to email me me.